boundary, or areas intended to prohibit trespass. c. the written consent must be carried in-person by the visitor while onsite and provided upon request of any law enforcement officer. Allows wildlife officers to enforce trespass laws onsite. 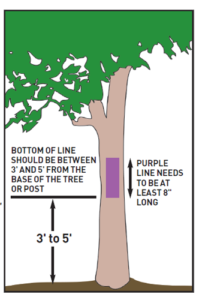 Allows landowners to post land using purple paint marks and/or by posting no-trespassing signs as currently allowed. For more specific information about the NC Landowner Protection Act, including how to post purple paint marks on private lands, to obtain a Landowner Protection Act FAQ, and view samples of permission letters, please visit the North Carolina Wildlife Resources Commission.